This tidy bungalow boasts an open floor plan and loads of flexibility. A covered entry leads to an open foyer, and the eye is drawn to the focal point of a lovely fireplace flanked by generous built-in cabinetry or the vista of windows offering backyard views. The kitchen is sure to be the hub of activity with generous island area plus easy access to the dining room and living room. The first bedroom is ideally situated to serve as a bedroom, den or office – ideal as family circumstances change. It and a second bedroom have easy access to a full bathroom. The master suite includes a very comfortable 5-piece bathroom and, of course, walk-in closet. A bonus space over the garage is ideal for a game room or media room plus an undeveloped basement allows for additional bedrooms or activity areas. The plan is designed with a full basement and could easily be built on a sloping lot with daylight or walk-out basement. A double garage with workshop area and covered grilling deck off the back top off the essentials. This comfortable home is suitable for every stage of life! Looking for other bungalow house plans? 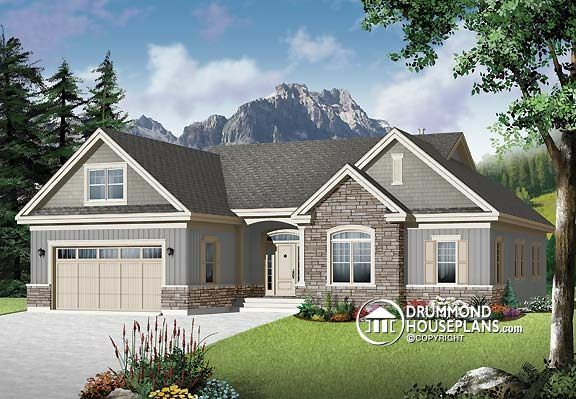 Check our 1 Story and Bungalow Design Collection, or Create a “New House Plans – Latest Trends” Alert to receive all of the latest designs direct to you by email!